Try your hand at one of Dracula's favorite recipes with our Spicy Vampire Bat Wings. After you make these Spicy Vampire Bat Wings, Halloween party-goers may never look at chicken wings the same way again! Mix chili powder, garlic, ground red pepper, and 5 Tbsp. each lime juice and chipotle peppers until blended; pour over chicken in large shallow dish. Turn to evenly coat both sides of wings. Refrigerate 30 min. to marinate, turning wings after 15 min. Meanwhile, mix remaining chipotle peppers and barbecue sauce until blended. Heat oven to 400ºF. 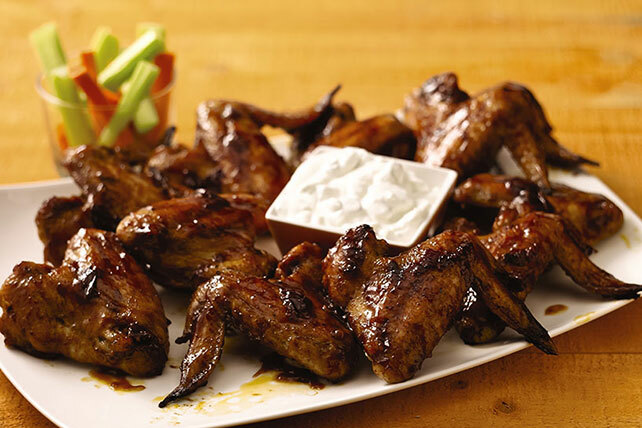 Remove wings from marinade; place in single layer on baking sheet sprayed with cooking spray. Discard marinade. Bake wings 35 to 40 min. or until wings are done, turning after 20 min. Brush with half the barbecue sauce mixture; bake 5 min., turning and brushing with remaining barbecue sauce mixture after 3 min. Combine sour cream, onions, zest and remaining lime juice. Serve with the wings. Serve these flavorful appetizers with cut-up fresh vegetables.